There are many different ways of cooking and dressing up a risotto. I have eaten a few different risottos but if I had to choose one risotto to eat for the rest of my life it would have to be mushroom risotto. I think that mushroom risotto is the king of all risottos, especially with some porcini. Porcini mushrooms are highly valued for cooking as they have a rich savoury flavour, meaty texture and pungent aroma. The mushroom flavours in porcini are enhanced when dried and I think I like it so much because I feel like it's the shiitake of the Italian world. This was my second time cooking risotto. The first time was in 2008, about 3 ½ years ago. The context to my first attempt at risotto was that I had to cook something for a pot luck dinner for friends who are vegetarians. I was at a lost for what to cook and someone told me that I could cook risotto. Risotto is vegetarian friendly! However, at that time I had never actually eaten risotto before. I’m Chinese, so I have grown up on steamed rice, fried rice, rice congee etc. but not risotto rice and whenever I ate out at Italian restaurants back then I would go for the pasta or pizza option. Risotto was foreign to me but I was aware of its existence and knew what it looked like. Sauting a flavour base of onion, garlic and celery, and then stirring risotto rice and stock for a while seemed doable, and I was told that the end result would be delicious. I managed to dig out a picture. As you can see the risotto looks like what day old leftover risotto should look like – a pile of stuck together starchy mushy mess. It didn’t have any of that creamy consistency that “makes it”. 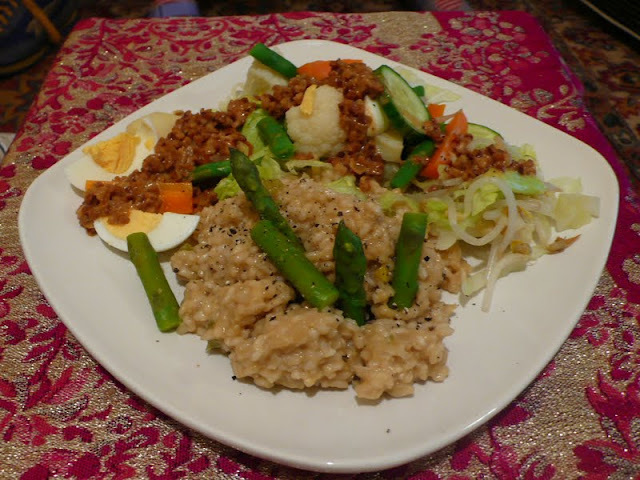 I even served it with a side of Indonesian Gado Gado salad because I was feeling adventurous. Talk about fusing cuisines! – what was I thinking? I’ll cook two different vegetarian dishes, any two will do, from completely different cultures and serve them together on a plate. I will then blanch some asparagus and try to stylize the plate a bit by sticking them into the risotto like erect tombstones….and it looks like a cyclone has descended on the plate as some of the asparagus stalks have blown over. My friends enjoyed the dish but the truth was that they couldn’t cook any better than me so I was in a win win situation back then. ….fast forward to the future of 2011. My attempt this time has greatly improved. I am a better cook now and I have also eaten many a risotto so that now I know what it should look and taste like, and what sort of texture in the rice I should be aiming for. During the last 10 minutes of cooking, I was testing the grains of rice every 30 seconds or so to see when the risotto would have that al dente texture which would indicate to me that it was a done deal. I liked tasting the risotto at different intervals as I was cooking it to see its transformation take place before my eyes and taste buds. Cooking is about tasting tasting tasting all the time while you cook to pre-empt failure. • 1 handful dried porcini, soaked in 400ml (1 ¾ cups) hot water for 30 minutes. Strain the porcini and reserve their soaking liquid. Set both aside. Heat a generous amount of oil in a frying pan and fry the mushrooms with the garlic and salt and pepper until brown and all juices have evaporated. Set aside. Put 4 tablespoon of oil and the butter in a heavy based saucepan and add the onions and a pinch of salt. Cook over a very low heat, stirring occasionally, till the onions are soft and transparent but have not yet started to brown. Pour in the rice and cook over a medium heat, stirring to coat and until it becomes translucent (~2-3 minutes). This is called toasting the rice to seal the grain so that you end up with risotto that is creamy but each grain maintains its own shape and it’s not all mushed up together. Then add in the wine and let it cook down. Add the porcini and some of their liquid and the sliced mushrooms. Pour in the stock a ladleful at a time and cook, stirring, until the rice has absorbed all the liquid before adding some more. Be careful not to let the rice get too dry. Carry on adding the stock until you have a creamy consistency and make sure that you are continually stirring as the stirring creates friction on the grains of rice for it to release a little of its starch - this is the secret to the creaminess of risotto. Before you add in the last ladle of stock, season the risotto to taste. The risotto rice should take about 20-25 minutes to cook - work by tasting throughout the stirring process to check the texture. The rice must be cooked but slightly ‘al dente’ and the mixture must hold together. Remove from the heat and stir in the parmesan. Stir well and check the seasoning. Pour the risotto into bowls and serve immediately.